Need to practice the letter b sound? Here’s a great resource to help you do just that. 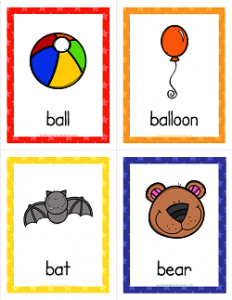 These things that start with b cards include a ball, balloon, bat, bear, bed, bee, bell, and button. Included is a title card, two smaller cards with the pictures and their words, and one card with just the words only. Put these on your whiteboard when B is the letter of the day and have your kids “read” them (of course the kids will know the words by the pictures! ).